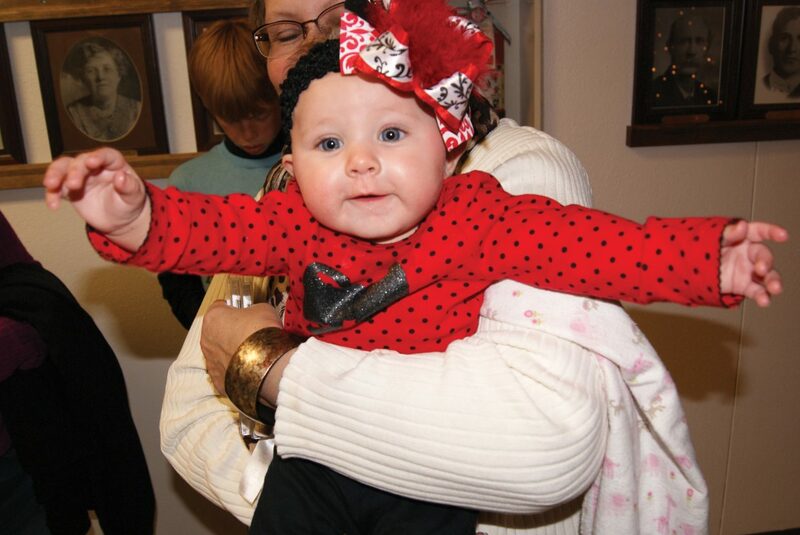 Kylee Hammer, six months, takes in all the sights Thursday night at the Festival of Trees. Moffat County Youth United Way and Key Club wrapped up its last night in a series of Thursday activities this week for the Festival of Trees. Twenty-two non-profits decorated trees in the Moffat County Courthouse for the community to enjoy throughout December. The night included a hot cocoa bar, where visitors could warm up with cocoa and Christmas goodies, caroling, as well as live entertainment including Stacey Mathers, Nicole Prestangen and Charleah Firestone on the harp. Mrs. Claus was there with some of her elves and helpers to visit with children.